The city of Spoleto had been under Roman control since 241 BC and the end of the First Punic War against Carthage. Located just eighty kilometres (fifty miles) to the north of Rome itself, it subsequently fell under the authority of the Byzantine exarchate of Ravenna, but only briefly. During the sixth century, Byzantine authority in Italy suffered badly in the face of sustained attacks by the Germanic Lombards, and Spoleto quickly emerged as an independent duchy, founded as such just two years after the Lombard kingdom itself and not generally subject to its overall authority. Spoleto has a fairly obscure history. It shared three of its rulers with the Lombard kingdom and, as such, was tied more closely to the kingdom than was its rival duchy, the more important Benevento, which bordered it to the south. Its territory took in the southern half of the modern region of Marche and most of Abruzzo. It also included the city of Reate (modern Rieti), a former major settlement of the ancient Sabini tribe which lies immediately to the north-east of Rome itself. Lombard chief. Independent from 575/576. Following the Lombard seizure of the region of Spoleto in 570, Faroald seizes Nursia and Spoleto to establish his own independent duchy. His fellow Lombard chief, Zottone, goes even further south to found Benevento. Ariulf captures Camerino, where it is later claimed that he has seen St Sabinus, the martyr of Spoleto, who helps him to victory. The Lombard chief converts to Roman Christianity as a result. 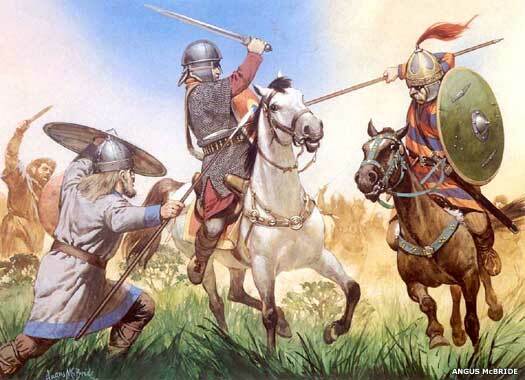 Upon his death, the two sons of Faroald fight to see who will become the next ruler, with Theodelap emerging victorious. He rules apparently entirely independently of the Lombard kingdom. In return for helping Grimoald to usurp the Lombard throne and reunite a divided kingdom, Count Transamund of Capua is granted the duchy of Spoleto. Count of Capua. Granted duchy by Grimoald of the Lombards. Son. Deposed by his son after despoiling Classis. Son of Faroald II. Died c.745. The Lombards take control of the exarchate of Ravenna. Byzantine imperial authority is no longer recognised, although it only takes two years for the exarchate to be recovered. Transamund rebels against Liutprand, king of the Lombards and forms an alliance with Pope Gregory III. The pope provides him with shelter while a substitute duke holds power in Spoleto in 739. Transamund kills Hilderic in 740 and regains his duchy, before being captured by Liutprand and sent forcibly to a monastery. The duchy is conferred upon Agiprand. Restored. Forced to enter a monastery. Duke of Clusium. Deposed by Transamund II. Being sent to a monastery does not prevent Transamund from regaining the duchy for a second time, but his rule is short-lived. Hereafter, the links forged by Liutprand effectively bind Spoleto closer to the Lombard kingdom, with three subsequent dukes also ruling the Lombards at different points in their careers. Duke of Friuli. King of the Lombards (749-756). The exarchate of Ravenna is recaptured by the Lombards, permanently ending Byzantine influence in Italy. Rome is delivered from Lombard attack by Pepin III, king of the Franks. This fulfils his role as the ordained protector of the church following Pope Stephen's visit to Paris, during which he had re-consecrated the Frankish king. The ex-Byzantine exarchate of Ravenna is transferred to the pope in the form of the Papal States, along Spoleto's western border. The exarchate is briefly re-captured by the resurgent Lombards in 755, but the following year the Carolingian Franks recapture the territory. The ex-Byzantine exarchate is handed back to Rome as the Papal States and northern Italy becomes part of the Carolingian empire. Brother. King of the Lombards (744-749). Abdicated. Having abdicated the Lombard throne after his misconceived siege of Perugia, Ratchis attempts to reclaim the throne after the death of Aistulf. He is defeated by Daufer and retires to a cloister. King of the Lombards (756-774). Gisulf is a vassal of Daufer of Brescia who is appointed by him to govern Spoleto in his name. When Gisulf dies, there is an interim period of about a year or eighteen months until Daufer appoints a replacement. The duchy falls to the Franks under Charlemagne and is mostly subsumed by them, retaining little independent identity or control. Hildeprand remains on the throne, but now as a vassal. He is married to Regarde, daughter of the late Duke Godefred of Alemannia (died 709). Frankish vassal, and possibly a Frank himself. Claimed both by the Carolingian Franks of Italy and Byzantium, the principality of Benevento is now attacked by the latter. Byzantine troops under the command of Adelchis, son of the last king of Lombardy, land on the coast around 790, but are almost immediately faced by a coalition of troops from Benevento, Spoleto and the Franks. The attack is successfully repelled, and the Franks think that they have retained nominal control over the region. However, Duke Grimoaldo of Benevento also resists them successfully, probably in the following year, and maintains the independence of his principality. Frankish vassal. Died after 5 months. Son of Suppone. Frankish vassal. Louis I wills the Frankish empire to his sons, but tries to ensure that the eldest gains the biggest share, in order to avoid the fragmentation of territory that so weakened the Merovingians. Lothar receives Francia Media (the Rhine corridor including the kingdom of Burgundy, and Italy). Spoleto is resurrected by the disintegrating empire as a dependent margraviate in 842, in order to help secure Italy against Saracen attacks. Upon Lothar's death, Francia Media is divided between his three sons. Louis II receives Italy and the imperial crown. Native vassals remain in place in Spoleto, governing in the Frankish emperor's name. Guy's death sees the duchy divided in two, with Lambert gaining Spoleto, and his brother, Guy II, gaining Camerino, which is raised to a duchy. The pair continue the fight against the Saracens, but Lambert is also guilty of massacring Byzantine subjects, and is deposed in 871, restored in 876, and subsequently excommunicated by Pope John VIII. Restored, and ruling jointly with Guido II. Brother. Ruling jointly, first with Lambert I and then with Guy III. Upon the death of Guy II, the duchy of Spoleto is reunited, with the new title of the duchy of Spoleto and Camerino. Berengar of Friuli is challenged by his chief rival in Italy, Guy of Spoleto, both of whom aspire to control the two halves of the former Frankish Empire. Guy has failed in his attempt to gain overlordship of the Western Franks, and now wants the Eastern Frankish throne. They engage in battle near Brescia and Berengar emerges as marginal victor, albeit with casualties large enough to force him to sue for a peace that lasts until 889. With the truce having expired, Guy attacks Berengar at the Battle of the Trebbia, and this time is successful, taking the Italian throne. Son. HRE (894-896). Shared the rule of Spoleto with Guy IV. Co-ruler. Prince of Benevento (895). Margrave of Camerino (889). Perhaps acting under pressure from Guy IV of the powerful Roman Spoleto family, Pope Stephen convenes the Cadaver Synod, in which the corpse of Pope Fromosus is disinterred. Duke of Camerino (897). Killed by the Romans. This is a period in which powerful women of the nobility play politics and influence papal rule in Rome. Consul Theophylact, count of Tusculum, and his wife, Senatrix Theodora, are the parents of Marozia. She is reputedly the concubine of Pope Sergius and gives birth to a son (the later Pope John XI). She also succeeds her father in being the power behind the papal 'throne'. Through Marozia's marriage to Alberic I of Spoleto, the family is able to continue the numbering started here with their son, Alberic II (932-954). Illegitimate son of Germanic Roman Emperor Hugh of Arles. 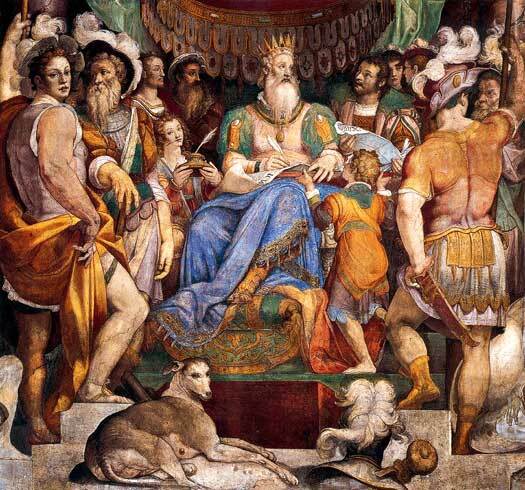 Berengar II, king of the Italian Franks, and Germanic Roman Emperor, takes control of Spoleto from its margrave. After his accession as Holy Roman Emperor, Otto I later adjoins part of its territory to the Papal States, and he and later emperors hold Spoleto as a gift to be handed out when necessary. Spoleto and Benevento are united by the Holy Roman Emperor Otto I, albeit briefly. 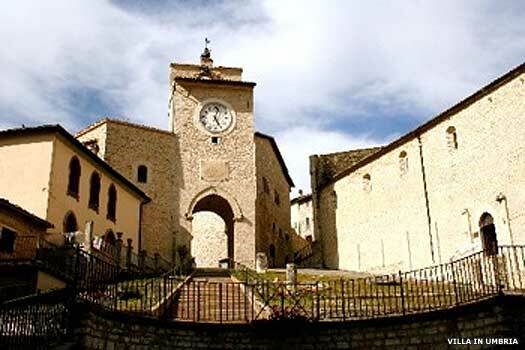 Following the death of Padulf, he detaches Spoleto again. Prince Landulf IV of Benevento (943-981). The joint principality of Spoleto and Benevento is partitioned amongst the sons of Pandulf, who fight endlessly to gain supremacy. Landulf IV gains Benevento, Capua, and Spoleto, and Pandulf II receives Salerno. However, Roman Emperor Otto I intervenes and hands Spoleto to Thrasimund IV, duke of Camerino. Then Pandulf II is granted Benevento, leaving Landulf with just Capua. Spoleto is granted to Hugo, margrave of Tuscany, with occasional local rulers in place under Tuscany's control, until the duke of Tuscany takes direct control again in 1010. Ademar's brief rule over Spoleto ends and Tuscany takes direct control again. Ademar is also theoretical overlord of Naples during the enforced absence of its duke. Duke of Tuscany (1014-1027). Died 1027. Spoleto is temporarily removed from Tuscany's control with the accession of Hugo II. Spoleto now becomes a constituent part of Tuscany, with no local control over its affairs. The papacy takes a turn at governing Spoleto as part of the Papal States, during the term of office of Pope Victor II. Following Godfrey's long reign, Spoleto once again becomes a constituent part of Tuscany, with no local control over its affairs. Tuscany takes control of Spoleto once more, until Holy Roman Emperor Henry IV appoints his new ally as ruler of the duchy, Werner of Urslingen. Tuscany again assumes direct control of Spoleto. Upon the death of Conrad of Urslingen, the papacy resumes control of Spoleto, this time for a longer period, under the powerful and influential Pope Innocent III. Opinion is divided on which of these ruled. Following the brief interruption of Berthold's rule (or that of Rainald of Urslingen, son of Conrad), Spoleto is drawn back within the Papal States, which retain it until the invasion of Italy by French Emperor Napoleon Bonaparte and his subsequent reorganisation of the Italian political make-up in 1808. France retains Spoleto until the final fall of the empire in 1815, at which time it is returned to the Papal States, but the creation of a single, united kingdom of Italy in 1860 sweeps away the Papal States themselves, and Spoleto becomes part of modern Italy.